My waffle weave fabric is finally off the loom, washed, dried, and ready to be cut and sewn into towels. .... from a barcode of the Guild's initials. I think it translated quite well. The finished towel size for the exchange is to be 18 by 24 inches. I figured the width in the loom based on my sample, which had a draw-in and shrinkage of about 30%. After weaving a bit on the towels, I recalculated, and was worried that the finished fabric would be too narrow. That's when I came up with a way to widen the warp on the loom (that post here.) OK. That slowed me down a bit until the added warp sticks were firmly wound onto the cloth beam. 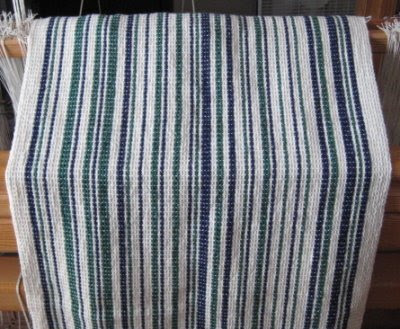 Ironically, the wet finished cloth now off the loom measures 19 inches in width. The original 10 inches that I wove on this warp (the one I thought would be too narrow), is 18 inches! So I had it right the first time. Better bigger than smaller, I always say. The stripes look great. A wash in hot water with a cold rinse might shrink them a bit more, if that is what you want. The towels I wove in straight twill continued to shrink with each washing for at least six months. I think you may be glad of the size you wove! Damn Leigh, that is one beautiful towel! I'm sure you won't by tossed from the exchange because your towel is wider than 18". So do you have to cut the sides, or is a little bigger okay? Will you make them longer too, perhaps, to balance the proportions? And, thanks! for the good weaving vibes. I'm finally making progress (a whole *foot*) on my weaving. Your posts are always an inspiring reminder. The stripes look wonderful -- overall a pleasantly random effect, and what fun to know that there is an actual meaning underneath. 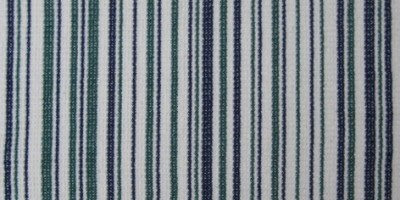 I've been pondering how to stripe a simple garter shawl; I bet your barcode technique would work really well. I don't understand, but I am impressed. I'm still trying to get ready to weave Ms and Os but discovered that the heddles on my second shaft were put on backwards - by me. A couple of weaving friends will be here this weekend so will have them help me lift the shaft and switch the heddles. If I get stuck on reversed heddles, you can bet I don't understand waffle weave. I think it's magic and you're a witch~~yeah, that explains it. so you call it waffle weave because it has the texture of a waffle? now, here's where we run into the brick wall of cultural comparison. you see, we don't have waffles in scotland, and despite being saturated by american TV and culture and certainly having heard of them, i've never actually seen one before in my life. i guess i should have paid more attention when the american base was open. The towels are great!!! I now have the inspiration to finish mine even if I can only do a little at a time. They washed up beautifully. Some lucky person in your exchange sure is going to love them.